Help Us: save real rainforest acres with the cast and crew of Guardians of the Galaxy Vol. 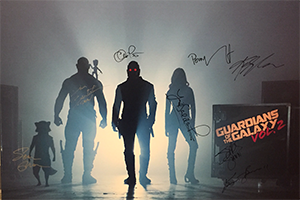 2: Chris Pratt, Zoe Saldana, David Bautista, Sean Gunn, Kurt Russell, Karen Gillan, Pom Klementieff, Michael Rooker and Director James Gunn! Healthy tropical ecosystems are imperative to maintaining our planet. Rainforests give us clean air to breathe, a stable climate, plants that produce medicine, and are home to thousands of animals and people that depend on their protection for survival. But over half of the world’s rainforests have already been destroyed, and a further 80,000 acres are lost every day. At Rainforest Trust, the average cost of purchasing and protecting half an acre of lush tropical rainforest is just $5. For every $5 ticket, you are saving half an acre of rainforest through Rainforest Trust AND you are granted one entry into the raffle to win a Guardians of the Galaxy Vol. 2 poster signed by the cast and director! AND now you will also win this baby Groot hat, exclusive only to the cast and crew of Guardians of the Galaxy Vol.2! The poster and hat have been generously donated by the Director himself, James Gunn! *While although the purchase of a raffle ticket is not considered tax deductible, 100% of each ticket purchase goes to conservation of tropical rainforest.